Our staff of writers consider themselves gearheads and tool collectors. But, the other day when we were in the shop, we were surprised to learn that only one of us had ever replaced our air compressor oil. That led us on a search to find the top brands before we changed the oil in our compressors at home. 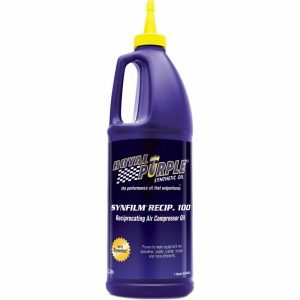 After extensive research, we believe Royal Purple Synfilm Recip 100 High Performance Synthetic Air Compressor Lubricant is the best option for most people. What Type of Oil Does an Air Compressor Use? First off, check your compressors owner’s manual for recommendations before changing your oil. Most air compressors use 30 weight, non-detergent oil. In colder climates it is a good idea to upgrade to 20 weight oil. The Royal Purple Synthetic Air Compressor Oil is rated ISO 100 which is equivalent to 30 weight oil and is a great choice for most climates. Unlike most engine oils, air compressor oil must be free of detergents to extend your compressors life and improve performance. Detergents can cause deposits on the internal components of the compressor, increasing friction and wear overtime. While writing this article we talked to several people that use 30 weight engine oil in their compressor without a problem, however we do not recommend this. Similar to engine oil, synthetic compressor oil will last longer and provide better protection over conventional oil. In our opinion it is always worth upgrading to synthetic oil for the extra benefits it provides. Changing the oil in your reciprocating air compressor is pretty simple. First, locate the drain plug and look for any obstacles that may get in the way of the drain process. Unlike changing the oil in your car or truck, draining the oil in your air compressor can get messy if you are not prepared. After you have located the drain plug, find a drain pan, plastic bottle or other small container to catch the oil. Secure your drain pan and remove the drain plug. Wait for the oil to completely drain. Some air compressors may require you to lift the opposite end of the compressor to allow all of the oil to drain completely. Once the oil has drained, put the drain plug back into place. Next, locate the oil fill cap. Use a small funnel to carefully refill the compressor with oil per your owners manual. Be careful not to overfill the machine. Check the fill level to verify you have enough oil. Then replace the oil fill cap. Properly dispose of your oil at an oil recycling facility or ask your local auto parts store if they recycle used oil. That’s about it. Congrats on changing your air compressor oil! While there are plenty of air compressor oil brands, we found that Royal Purple Synthetic Air Compressor Lubricant is the best option for most people. If you decide to purchase a different brand of oil, remember to look for an oil that is designed for air compressors. These are detergent-free and will reduce carbon deposits in your compressor. What brand of compressor oil have you tried? Leave us a comment below and let us know!